NEW YORK (AP) — United Airlines is getting tough on passengers with oversized carry-on bags, even sending some of them back to the ticket counter to check their luggage for a fee. The Chicago-based airline has started a push to better enforce rules restricting the size of carry-on bags — an effort that will include instructing workers at security checkpoint entrances to eyeball passengers for bags that are too big. In recent weeks, United has rolled out new bag-sizing boxes at most airports and sent an email to frequent fliers, reminding them of the rules. 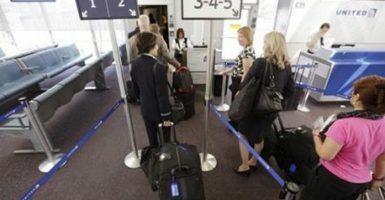 An internal employee newsletter called the program a “renewed focus on carry-on compliance.” The size limits on carry-on bags have been in place for years, but airlines have enforced them inconsistently, rarely conducting anything beyond occasional spot checks. United says its new approach will ensure that bags are reliably reviewed at the security checkpoint, in addition to the bag checks already done at gates prior to boarding. Passengers are typically allowed one carry-on bag to fit in the overhead bin, which can be no larger than 9 inches by 14 inches by 22 inches. Fliers can also bring one personal item such as a purse or laptop bag that fits under the seat in front of them. People flying with oversized bags can have the suitcase checked for free at the gate, a longstanding practice. But those who get halted at the entrance to security must now go back to the ticket counter and pay the airline’s $25 checked-luggage fee. (Yahoo News).